AAP won 20 of Punjab's 117 seats. Then, it was crushed in local Delhi elections by the BJP. Mr Kejriwal, who is the Chief Minister of the national capital, said his party had not, in fact, lost the elections, but had been trumped by rigged voting machines. Arvind Kejriwal and other AAP leaders pay obeisance at Golden Temple in Amritsar on Monday. 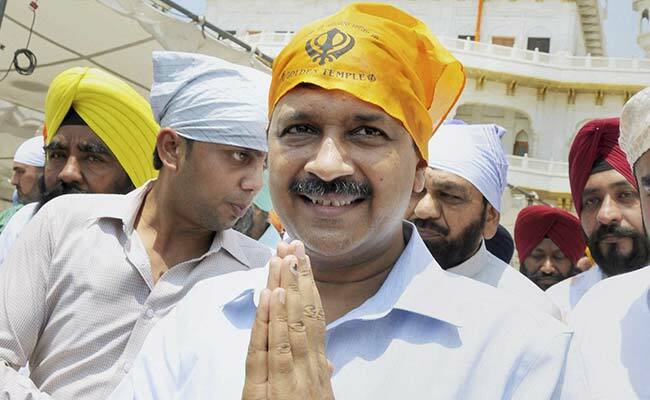 Arvind Kejriwal was at the Golden Temple in Amritsar today, making his first visit to Punjab since his Aam Aadmi Party or AAP performed disappointingly in the election three months ago, losing the state to the Congress. AAP's runner-up result contradicted the forecasts of several exit polls and was used by opponents to suggest Mr Kejriwal, who led the AAP campaign, has no drawing power outside Delhi. AAP won 20 of Punjab's 117 seats. Then, it was crushed in local Delhi elections by the BJP. Mr Kejriwal, who is the Chief Minister of the national capital, said his party had not, in fact, lost the elections, but had been trumped by rigged voting machines. The Election Commission objected strongly to his accusations of it colluding with the central government to fake huge BJP results in Punjab and Uttar Pradesh. A series of AAP leaders, however, disagreed with Mr Kejriwal's theory and said the party would examine what had caused a loss of faith among voters. Sanjay Singh, who was in-charge of Punjab, quit his post over the state's result. AAP was then subsumed by a crisis over its popular poet-leader Kumar Vishwas threatening to exit the party. He was placated by being put in charge of Rajasthan, where elections are due next year. Then minister Kapil Mishra, who was sacked over alleged non-performance, accused Mr Kejriwal of vast corruption. The Chief Minister's visit to Punjab - he was accompanied today by Bhagwant Mann, the party's most senior leader in the state - comes ahead of a crucial election for the Lok Sabha seat from Gurdaspur. Actor Vinod Khanna, who was a BJP leader and the MP from here, died last month. His wife, Kavita Khanna, is reportedly being considered as the BJP's candidate. AAP has not yet announced who it will field. Its chief will meet with party workers today in an attempt to reverse their sagging morale.